Philips has yet again created an outstanding defibrillator with their Philips HeartStart FRx AED, a defibrillator with a plethora of features that places the Philips HeartStart FRx in a category with few rivals. 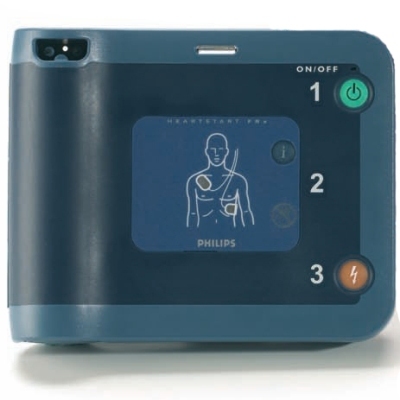 Building upon Philip's reputation of over a century in technological advancements, the Philips HeartStart FRx defibrillator is part of Philips' praised HeartStart family of AEDs for both laypeople and experienced rescue personnel. More advanced than the Philips HeartStart OnSite AED, Philips' model for the inexperienced layperson, the Philips HeartStart FRx was created for first responders arriving on scene in a variety of situations that can often be too demanding for most defibrillators. In short, if you're in need of a defibrillator to be used outdoors, by first responders, and/or could be used in situations that take responders outside of the home or office, the Philips HeartStart FRx AED is one of the best choices to be made. As can be said for all of the AEDs within Philips' HeartStart family, the Philips HeartStart FRx is one of the best AEDs available, its only serious competitors being Medtronic's Physio-Control LIFEPAK models. The design of the Philips HeartStart FRx is near flawless, being one of the smallest and lightest defibrillators on the market. Weighing only 3.5 pounds, the sheer lack of weight make the Philips HeartStart FRx a great AED for first responders and those on the field that may have to travel some distance to a victim of sudden cardiac arrest. The Philips HeartStart FRx is also incredibly rugged and tough. The Philips HeartStart FRx AED can withstand jetting water, loads up to 500 pounds and one-meter drops onto concrete. Simplicity is also key for both trained responders and those first arriving on the scene. Designed to be as simple to use as the Philips HeartStart OnSite AED, the Philips HeartStart FRx AED shares many of the features of the Philips HeartStart OnSite AED that make it the preferred model of thousands. CPR Coaching is provided by the Philips HeartStart FRx, in addition to intuitive and easy-to-understand icon-driven operation. Through clear and calm voice commands coupled with descriptive visual icons, the Philips HeartStart FRx AED guides you through every step of the process of defibrillation, even down to minute - yet crucial - details and reminders, such as calling emergency rescue personnel and services. When in a rescue situation, simply press the blue i-button of the Philips FRx and the HeartStart CPR Coaching will be activated to provide you with assistance with your CPR. For an untrained layperson forced to respond to a scenario of sudden cardiac arrest, this simple feature of the Philips HeartStart FRx AED could very well be the difference between life and death. And for those trained, simple guidance is always appreciated to help calm those nerves. Ease of use extends to the pads used by the Philips HeartStart FRx AED as well. 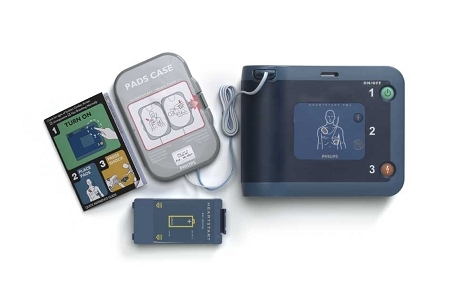 Using Philips' patented SMART Pads II, the Philips FRx AED enables you to save valuable time by utilizing pre-connected pads that provide effective and lifesaving therapy for both adults and children alike. With the ability to be used on both children and adults, the Philips HeartStart FRx allows you to save money with the elimination of having to purchase different pads sets for different patient types. When treating an infant or a child, simply insert the Infant/Child Key into the Philips HeartStart FRx and the AED will adjust itself to provide special pads placement and CPR instructions. 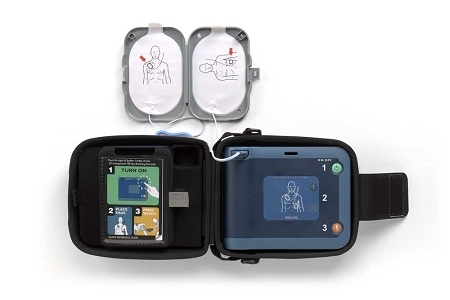 The pads icon also flash to show responders the appropriate pads placement, in addition to reducing the shock energy level to a more appropriate level for an infant or child (considered less than 55 pounds or 8 years of age). Wireless data transfer is also available on the Philips HeartStart FRx. Providing a mobile, wireless solution for data management using the Palm handheld platform, the Philips FRx AED features an infrared data port for easy and simple data transfer without hardwire compatibility issues or the need for expensive cables. Preferred by many rescue and medical professionals, the Philips HeartStart FRx AED also features Philips' SMART Biphasic technology. The Philips HeartStart FRx AED's biphasic waveform delivers a highly effective yet gentle defibrillation shock, providing therapy that is efficient but also gentle on the victim's heart. The Philips HeartStart FRx also features SMART Analysis, a feature that enables the HeartStart FRx to shock only when needed. SMART Analysis automatically assesses the victim's heart rhythm and will not deliver a shock unless determined to be shockable – even if the Shock button of the Philips HeartStart FRx is pressed either intentionally or accidentally. The versatility of the Philips FRx AED also extends to its compatibility with advanced defibrillators. Once recruited help arrives by EMS, the handoff between responders and EMS is fast and easy with the Philips HeartStart FRx, enabling seconds to be saved, if not minutes. With Philips HeartStart FRx adapters, pads can be plugged into AEDs from other manufacturers to ensure continuity of care and best results in your rescue. As all HeartStart AEDs feature, the Philips HeartStart FRx AED also includes Philips' patented Quick Shock. After the American Heart Association Guidelines reported a "reduction in the interval from compression to shock delivery by even a few seconds can increase the probability of shock success," Philips created the technology that places the Philips HeartStart FRx AED as the fastest in its class at delivering a shock after CPR. Maintenance for the Philips HeartStart FRx AED is also a cinch. The Philips HeartStart FRx AED is powered by a four-year battery that is easily replaceable and easy to install. The Philips HeartStart FRx AED conducts automated daily, weekly and monthly self-tests, ensuring your Philips FRx is ready when needed. The Philips HeartStart FRx also tests its own functionality down to calibration of its circuits to the readiness of your pads. With over 85 tests, the Philips HeartStart FRx is one of the most comprehensive self-testing AEDs on the market, making ownership of the Philips HeartStart FRx AED virtually maintenance-free. In summation, the Philips HeartStart FRx AED comes with our strongest of recommendations. Best suited for first responders and rescue situations that can take one out of the home or office and into situations of greater demand, Philips has thought of just about everything that responders, trained or not, may find themselves in when sudden cardiac arrest strikes with their HeartStart FRx AED. In short, the Philips HeartStart FRx AED is a defibrillator featuring the finest lifesaving technology and design.